It would not be an overstatement to say that, during my first month of work at CANVAS, I was perpetually awestruck. I had already met Srdja Popovich, at the 2017 Oslo Freedom Forum and listened to his incisive remarks on what should be done to thwart the rise of illiberal democracies (some of which had sprung up in the very heart of Europe). But I was yet to comprehend the full extent of CANVAS’s work and its significance – to learn more first-hand about the principles of nonviolent struggle Popovic and his fellow Otpor! Partners had articulated the intuitive applicability of the tactical advice they had made available, for free at canvasopedia.org, to anyone who aspired to build a movement and drive progress. The CANVAS team had turned Belgrade into a hub for activists who hailed from all over the world and were as similar in their fundamental mission as they were different in the particular challenges they faced. In July alone, a member of the umbrella movement from Hong Kong, a hip hop artist who advocated for the indigenous rights of Native Americans, and three heads of South Sudanese NGOs visited the office, located off the beaten track in the new part of town. They all recognized Otpor!’s historic achievement and strived to model their efforts after it, but, as the trainers and staff members of CANVAS always emphasized, there was no simple uniform way to do so. The latter were more than willing to elaborate on the Serbian experience of peaceful political transition, but with the important caveat that its particularities were inherently different from everyone else’s. This recognition that universal insights and strategies only work when combined with a profound understanding of one’s specific situation is, to me, the most fascinating aspect of CANVAS’s work. Rather than providing its partners with cookie-cutter solutions, it sought to give them tools for thorough analysis and strategy-building. These tools are as intuitive as they are groundbreaking – one of the organization’s online publications, for instance, straightforwardly dispels the misconception that power in society resides exclusively in the central government and offers a concise analytical framework for assessing the interplay of forces which sustain a particular political system. A further chapter gives advice on identifying the issues that matter to every single citizen and can serve to catalyze action, without imposing upon the reader a narrower conception of what, precisely, those issues should be. In my invariably limited experience, CANVAS’s partners readily recognized that the transfer of knowledge they wanted to participate in was a two-way process. They were coming to learn, but also had to teach their trainers (and subsequently, their potential supporters) about their vision for change and the obstacles in their way. Observing those exchanges, on the other hand, was a true learning experience. I remember how former Otpor! member Sinisa discussed overcoming factionalism (with which Balkan people have been bitterly acquainted) with one of our South Sudanese visitors, who had just shared his worries that the myriad tribal identities represented in his newly-formed country would always stand in the way of a genuine unity of purpose. Shortly upon leaving, this same individual said something which deeply resonated with me and one of my persistent apprehensions as a student of political theory: He said many foreign-educated experts who wanted to bring Western democratic institutions to Africa had complacently assumed this model was universally applicable and could be implemented in one full swing, without the protracted conflict and frustrating backsliding which had accompanied the much longer process of democratization in Europe. Our responsibility, as a new generation of leaders, was to expose the fallaciousness of such enduring misconceptions and replace them with richer, more genuine understanding. This prescription struck me as a universal task: thinking deeply about the norms we presume are commonsensical, examining their origins – and being be prepared to revise them if that’s what the facts of life demand was required not only of the activist, but of the well-rounded democratic citizen as well. The other general lesson one inevitably learns through working with CANVAS is that no one can do the hard thinking and pursue lasting positive change but the “ordinary” citizens themselves (“the hobbits”, in Srdja’s favorite LOTR analogy). 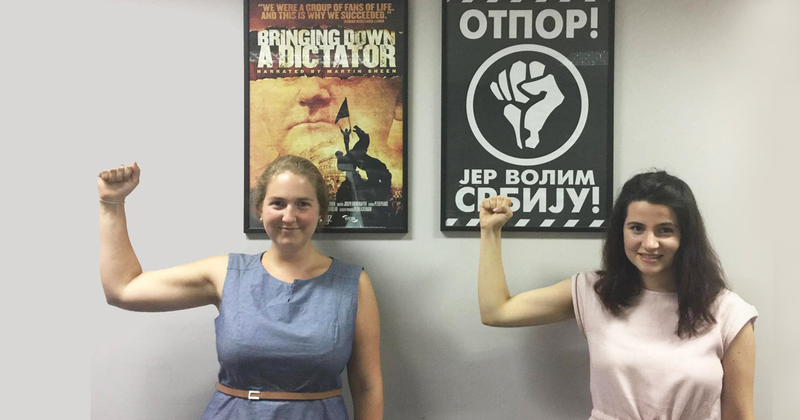 The “ordinary” people which formed Otpor!, a few of who fellow interns and I had the privilege to meet this summer, wanted the same basic freedoms and cared about the same things as everyone else. What turned them into modern-day revolutionaries was the realization that, unless they did something, no one would; what made their movement a success was transforming this realization (together with some proverbial Balkan stubbornness) into meticulous planning, unity and discipline in the face of adversity.